Albert Chilambwe visits a remote village to deliver sterile gloves for the Traditional Birth Attendants and conduct a beekeeping business workshop. In the fall of 1997, Delia and Mark Owens turned over their eleven year research and conservation project in North Zambia to their former funding partner, the Frankfurt Zoological Society of Germany. Months later, FZS determined that they could not continue all of Delia and Mark's programs, specifically Village Outreach Programs. Happily, the two Zambian men who had headed Small Business Development and Agriculture Assistance under Delia and Mark's directorship determined that they would remain in Mpika and continue these programs on their own. HAMMER SIMWINGA: Hammer Simwinga continues to support that work today with vision and determination. He is taking new and effective programs to an ever widening circle of villages improving the lives of the people and protecting the wildlife. The Owens Foundation is pleased and proud to support him in his efforts. Hammer's work is so successful that Chiefs in other areas are asking us to support him so that he can develop these programs in their chiefdoms. Though their wildlife has been completely depleted by poaching, if these proven village projects can be developed, wildlife can be reintroduced into the lush but vacant habitat. 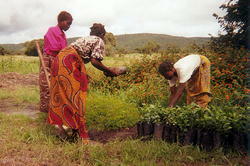 EMPOWERING WOMEN: Hammer's organization targets 68% of their programs towards empowering women. They have found that if you help a man, he may leave or die or he may have more than one family. If you empower a woman, you help that woman and all of her children. Also -women historically had no options, no voice and no power. Now they band together in groups of 10 and pool their assets to support their business endeavors. Hammer calls this Capacity Building. Now these women are respected in their communities and have a voice in their future as well as that of their children and their village. REVOLVING LOAN FUND: Hammer identifies business people in each village who receive loans that are repaid over a two year period to a revolving fund which then provides funds for additional business and agriculture projects. This repayment schedule allows each businessperson to make a profit and repay their loan in a reasonable time frame. Each loan recipient receives business training and technical assistance in either business or agriculture. BEEKEEPING: The Owens Foundation's first grants to Hammer's non-governmental organization established Beekeeping industries in villages located near North Luangwa National Park. Beekeeping provides honey and beeswax to the village, income to the beekeeper and support for agriculture through crop pollination. Each beekeeper receives business training and technical assistance. Hammer and his team are establishing a Beekeeper's Association so the businessmen and women can share information on improving their work. There is a large market in Europe and North America for organic Sub-Saharan honey. As more and more beekeepers are established, this market can provide valuable income for the people of North Luangwa. Bees also keep the recovering elephant population from eating farmers' crops. Bees sense elephants approaching - perhaps irritated by the elephants' low frequency infrasound - and chase the elephants sometimes for several kilometers - stinging their sensitive ears. Hammer and his team have experimented with a variety of apiary designs and constructions. They have found that hives made right in the village of mud and small amounts of cement are very economical, environmentally sound and sturdy. CHILI PEPPER PLANTING: Hammer and his team have been very successful in a new project instituted in 2005 - planting chili pepper plants adjacent to crop fields. Chili peppers provide another cash crop for the farmer and also protect the fields from hungry elephants. As in other parts of Africa, elephants take one chomp of hot chilies and run away sneezing - and they don't come back. Elephants never forget. Farmers are also making a paste out of dried chilies and painting it on nearby plants or they make 'chili bombs' using tin cans containing a mix of dried chili pepper and diesel that they light when elephants approach their crops. The challenge is to stay ahead of the recovering elephant population by spreading the 'chili technology' to more and more villages. OIL PRESSING: One of the most successful projects that Delia and Mark Owens established was sunflower seed cultivation and oil pressing. In the 80's, there was no source of cooking oil in the remote villagers. They only way to obtain cooking oil was to trade poached bushmeat or ivory with commercial poachers. Now - oil is made right in the villages and poaching is interrupted. Many of the simple fulcrum and lever presses installed in the 90's are worn out. Some pressmen and women have saved the $500 to replace their presses but they need assistance with ordering and delivering the presses. You can help by donating to replace and install more presses. AGRICULTURE SUPPORT: Hammer Simwinga is trained as an agriculture specialist and he continues his work assisting villages with improved agriculture - expanding crop variety (encouraging high protein legumes for improved nutrition) and instituting improved agriculture techniques including the use of green composting in place of expensive and environmentally damaging chemical fertilizers. Hammer encourages farmers to rotate their crops and plant crops that fix nitrogen in the soil. He has been very successful in discouraging the old slash and but type of farming where forests were cleared and burned, the land planted for one cycle before abandoning that field and moving to clear more forest land. Hammer is also working with village women to cultivate and dry mushrooms as a cash crop that also provides nutritional variety. FOOD STORAGE: Hammer and his team are also facilitating the building of concrete and brick Food Storage Buildings in the villages so that farmers can bring their crops for safe storage until they are needed. Villagers make the bricks in their village providing all of the labor - hauling sand and gravel in dish pans from the riverside. In the past, villagers lacked adequate storage facilities and the critically important food that they raised was often lost to rodents and rot. Now they can weigh and mark their corn, beans, peanuts, onions, sweet potatoes and more and safely store them in the community storage building, returning for portions of their crop as they need it through the year. 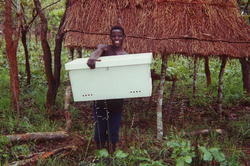 Food availability in the villages reached by the Owenses and Hammer Simwinga has doubled over the poaching days. RURAL HEALTH: The Owens Foundation is providing support for the Traditional Birth Attendants (TBAs) trained by Delia and Mark's Rural Health Program to improve the health of the people living near the Park. The Foundation has trained additional TBA's to serve the new villages being reached by Hammer and his team. We have also provided Medical Kits and supplies for the TBAs. Recently, an American couple, both Veterinarians donated stethoscopes and umbilical clips for use by all of the TBAs. Additional donations of bandages, antibiotic soap, Betadyne, antibiotic ointment and latex gloves are always needed and greatly welcomed. Delia and Mark Owens have raised funds to assist in the building of schools in Fela and Chilyaba villages. The Foundation has funded desks for the schools made by local carpenters. We are working to expand and update other remote schools and teacher housing in the North Luangwa area. THE FUTURE: As the ring of human prosperity continues to grow around North Luangwa National Park, the wildlife is less and less threatened by poachers. The village people living near the park do not need to poach or work for commercial poachers to feed their families. Their income today from legal, sustainable agriculture and business development is one hundred times more than it was from poaching and their quality of life vastly improved. The people and the wildlife of North Luangwa can coexist and tourists from all over the world are coming to see this beautiful place, its people and its wildlife. 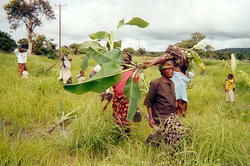 Village women working with agroforestry project funded by Harvest Help. The Owens Foundation has partnered with Harvest Help: a non-profit organization based in the United Kingdom, which is dedicated to improving the lives of rural Africans-particularly in Zambia. 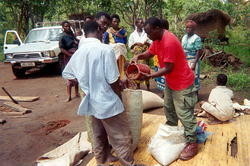 Harvest Help's focus is farming and food production as well as improving clean water and education. Through cooperative efforts, the Owens Foundation and Harvest Help are seeking to improve the lives of the people living near North Luangwa National Park so that both human and wildlife populations can flourish. Harvest Help employs Hammer Simwinga to carry out their agriculture assistance programs, which include seed loans, introduction of improved agricultural techniques such as "green composting", introduction of high protein crops to improve nutrition and more. a compter provided by Harvest Help. The Owens Foundation has provided salary for NLWCCDP Small Business Director. 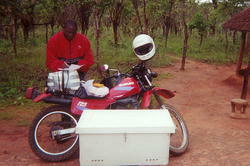 The Owens Foundation has also purchased a motorbike for the use in Village Development in the remote rural villages. trees into groves near their village.